Chalk: Dinosaurs Come to Life! 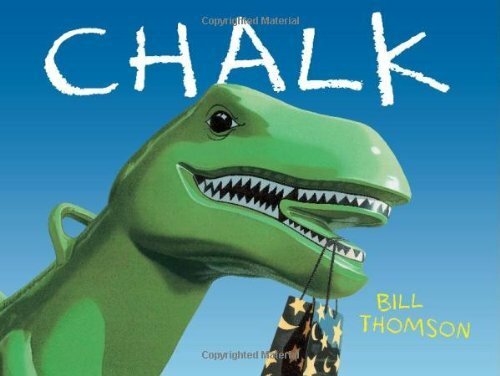 For this round of Early Childhood sessions I picked one of my favorite picture books: Chalk by Bill Thomson. If you don’t know it, I encourage you to run to Powells (or your closest locally owned bookstore if you’re not in Portland) and buy it for your library. Its a wordless picture book that tells the story of three kids on a rainy day who find a bag of magic chalk, and one of them uses it to bring a giant T-Rex to life. The ending is creative, and the whole tale leads to some great discussions around reality vs. imagination. It even has an element of scary anticipation - will the T-Rex eat the kids or will something save them? This is also a great book for yoga with kids (lesson plan below). We took Rain pose from last session’s Little Cloud sequence and incorporated it as the starting and ending point for the Chalk sequence. For Sun pose, we did a modified sun salutations, just allowing our bodies to stretch up as the sun rises and bend forward as the sun sets. For butterfly pose, the kids had a great time making their “wings” flutter fast like a butterfly late for dinner, or slow like a sleepy, lazy butterfly. And T-Rex pose was the best. We did it three times and each time the kids’ roars got louder and louder. It was awesome. The post-reading activity is one I’ve done in the past, and its always a hit. At first the kids are slightly disappointed that nothing they draw with chalk comes to life. But once I start engaging them to think creatively, they really get into it and start spreading their art all over the walkways. Today one little girl said with excitement,” Ms. Callaghan I drew a butterfly and then I SAW one! !” She kept going with her imagination until she had conjured up tons of butterflies and other creatures that live in the tree next to her classroom building.